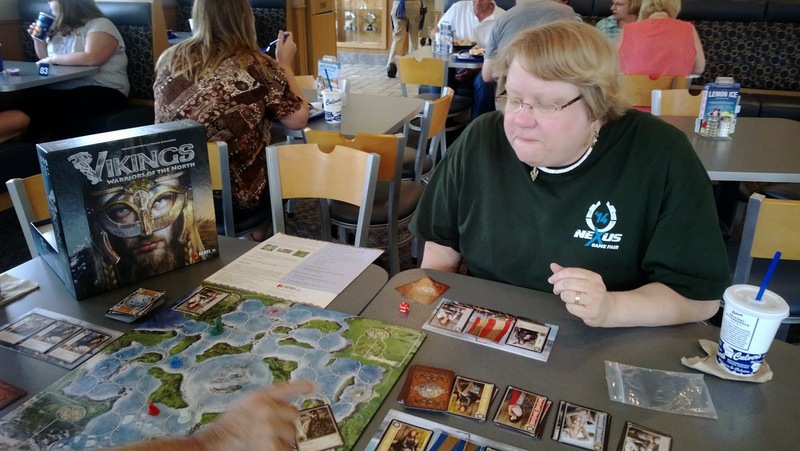 Last Friday, at the weekly Culver's group, my friend Wendy brought along Vikings: Warriors of the North which she picked up at the Nexus Game Fair for a nice discount. The rules with pictures of all the components have been made available online here. I very much enjoyed this game. I will repeat that this is a very fun game. However, it seems like it suffers from not needing to be in so big a box. This was probably padded a bit in its size and still didn't need to be in a big box. I feel the game board might have been replaced by some cards which could be arranged to make the board then the whole thing could easily have fit in a Munchkin/Zombies!! !-sized box. Better still, replace the physical components and player mats, as well, with counters and a few more cards and fit it all in a double-deck card box for increased portability. If this were the case, I would have this with me at all times, alongside Love Letter, as games to play and re-play whenever there was an hour or so to kill with some gamer friends.